The turmeric says turmeric, and is used as a spice, an artificial color, and a herbal medicine by the perennial of the ginger department turmeric belonging. In a usual turmeric, it is said the autumn turmeric, and a spring turmeric (curcuma) and a purple turmeric (zedoary) are different things. Because the turmeric that neighbors had harvested had been dried, it was going to take in the photograph, and I was allowed to drink the turmeric tea. It is possible never to drink though it is a very bitter taste and the compliment was a delicious dish taste that cannot be said. The element of curcumin of the turmeric has the effect of recovering working of the weakening liver. Moreover, it is an element named [ta-meron] of the turmeric that it is used as dyestuff and an artificial color, and the curry is yellow in autumn. Yellow that dyes radish pickles is the one taken out of the turmeric. The pigment composition with a yellow turmeric is a curcumin. The medicinal effect of the curcumin promotes the secretion of bile, and the healthy stomach etc. are effective. [Ta-meron] has the action that promotes the secretion of bile and the action that controls the growth of the helminth Anisakidae as other medicinal effects. The cineole has the antiseptic effect. It seems to take sake and because the drinker is effective in the liver well, to take the turmeric well. However, bitter of that doesn't become it anyhow. The underground stem of the turmeric is wet-cleaned and the skin is taken. It dries enough in the sun after it slices thinly and it breaks in detail, and you may use, and I think tea to be acceptable because it grates like the life, and I pour the hot water. The rhizome of the turmeric is thinly sliced and this photograph is dried in the sun. It dries it by using the one that is called the winnower made of the bamboo. I think that I use it easily when flouring it with the mixer after this. It is possible to make it to the turmeric sake by soaking it to white liquor and sugar. The amount is added and subtracted according to the favor though the material is a slice 500g, the white liquor 1.8 liters, and the crystal sugar 300g of the life turmeric. It is a spice and a color of the turmeric that uses for the curry. 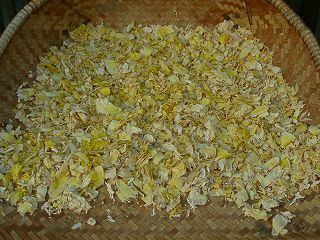 It is used as a yellow artificial color like there is an alias of [kizomegusa] of radish pickles etc. Because the turmeric is the tropics Asian originally origin, it is weak to the cold. It was grown well in Okinawa and Southern Kyushu in Japan. Therefore, cultivation in the cold provinces might be a little difficult. Compost, the hums, the foul dung, and the organic fertilizer such as oil cakes are mixed with as a little as the cultivation of ginger moist soil. The rhizome of the turmeric is planted in about 5cm of about 50cm and the soil coverings between stocks around the April-May and it applies it. 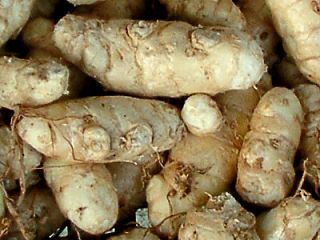 The leaf like to ginger comes out when growing up, and the rhizome (potato) grows. It will dig by about November, it takes, and it harvests because it is weak to the cold. The rhizome is kept in a warm point because it is weak to the cold. It is said the curcuma (wild turmeric), and has been used for a long time as a Chinese medicine. It is not suitable for for food though is said bitterness and the sharp taste are strong, the refinement of oil element and the mineral are abundant, and it is good for the promotion of health. A pink flower blooms in early summer. It is used a lot as food by the turmeric in autumn for ..doing.. cooking if it is usually said the turmeric. A white flower blooms in autumn. It is said the zedoary, and it is said it is effective in Helicobacter Pylori, and is said that there are a healthy stomach and an antiulcer effect. It is the very bitter one. When this is taken in large quantities, it is likely to become a poison though there is a medicinal effect in the turmeric, too. Please keep from for acute jaundice, cirrhosis, the inflammation of the gall bladder, the pregnancy, and the ulcus pepticum. It is that the drinker is not good for the liver that the turmeric is taken too much with the good squids. Please take care.